After the onset of limited trade under the OFF program, during the “recovery” phase, the Regime was better suited to offer either oil or cash for its procurement needs. ISG has identified companies in the following seven additional countries willing to engage in unsanctioned trade with Saddam during this phase: Syria, Turkey, South Korea, China, France, the former Federal Republic of Yugoslavia, and Bulgaria. Syria began to emerge as a primary transshipment and procurement facilitation partner, although Turkey served as a transshipment point, presumably focusing on consumer goods via its trade Protocol with Iraq. South Korean private firms traded in high technology items such as computer and communications equipment. Companies from China and France began negotiating for key equipment sales in this period. The former Federal Republic of Yugoslavia and Bulgarian firms may have been willing to risk international scrutiny from trading with Iraq due to the lure of high profits, lack of effective government oversight, and government corruption in the wake of the collapse of the Warsaw Pact. Syria was Iraq’s primary conduit for illicit imports from late 2000 until OIF. Under the auspices of the Iraq-Syria Protocol, Iraqi ministries and other entities would sign contracts with Syrian companies for goodsand services prohibited by the UN OFF program. SOMO databases show that Iraq signed contracts worth $1.2 billion, with payment dates from October 2000 through April 2003. These contracts relate to Iraq’s imports financed from SOMO accounts under the Iraq-Syria Trade Protocol. The funds most likely came from the protocol credit account controlled by SOMO. Military and security entities openly contracted with Syrian companies under the auspices of the Iraq-Syria Trade Protocol, according to the SOMO database. The MIC, MoD, and the Presidential Diwan (the latter acting on behalf of the IIS, RG, and Military Intelligence Division) contracted for $284 million worth of goods—24 percent of the total procurement noted. Of this $284 million, 60 percent ($169 million) was signed with one company, SES International. When all Iraqi procurement entities are included, SES signed contracts worth a total of $187 million. Although the SOMO database does not include specific information about the goods contracted for, the beneficiary companies listed include MIC research centers and manufacturing companies. The MoT and the MoTC imported goods for the MoD and the security forces according to the SOMO database. The MoT imported goods valued at $2.9 million and the MoTC imported goods valued at $8 million for the MoD. The MoT and MoTC contracted for an additional $9.9 million in goods for Iraq’s Military Intelligence Division, General Security Division, and General Police Division. The MoT often acted on behalf of other entities, including security and research entities such as the MIC and the IAEC, according to a former senior Iraqi government official. The MoT accounted for 25 percent of the imports from Syria listed in the SOMO database. It is possible some of the MoT transactions not specifically mentioned as being on behalf of MoD or security forces aforementioned also were destined for Iraqi security, industrial, and research facilities. How much of these other MoT imports may have been destined for these end users is not known. The SOMO database does not mention any MIC transactions that were not explicitly contracted for by MIC (see Figure 57). The Central Bank of Syria was the repository of funds used by Iraq to purchase goods and materials both prohibited and allowed under UN sanctions. According to the MIC Director Abd al-Tawab Mullah Huwaysh, Syrian traders who imported weapons and materials for Iraq worked extensively with MIC front companies. The Syrian traders were also required to share their profits with the other traders. The owner of the Syrian trading company SES, for example, frequently complained that he had to give up too much of his profits to the other traders. Dhu al-Himma Shalish, head of Syrian Presidential Security and a relative of Syrian President Bashar al-Asad, owned the SES International, and were heavily involved in the Iraqi weapons trade, according to a source with direct access. Dhu al-Himma’s nephew Assif Shalish managed SES and its subordinates. SES International reportedly was the primary facilitator for the transshipment of weapons and munitions, as well as many other goods purchased outside of UN channels, through Syria to Iraq. ISG judges that this close relationship may have been based, in part, on Dr. Shalish’s personal friendship with the former Presidential secretary, ‘Abd Hamid Mahmud al-Tikriti. 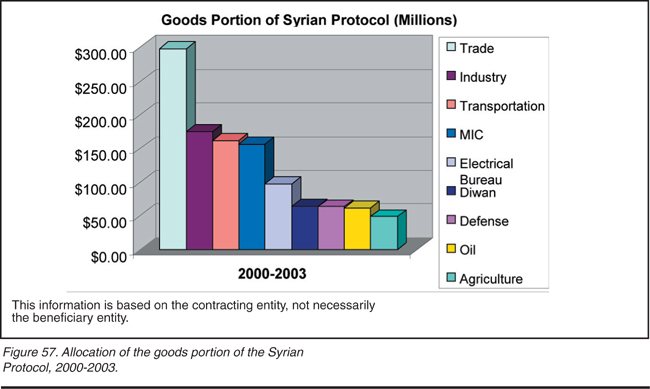 According to captured SOMO records, half of the goods paid for by the MIC through the goods component of the Syrian protocol between March 2000 and 2003 went through SES. According to those deals recorded in the SOMO records, SES transactions during this period amounted to $86.4 million. According to an interviewee, SES officials did not participate in any negotiations between Baghdad and the supplier and were not privy to the details of the contracts signed between these entities. Dr. Asif Shalish traveled to Baghdad to coordinate shipments of weapons and sometimes received cash payments. At other times, the Iraqis reimbursed Shalish by transferring funds from their overseas accounts to an SES account in Syria. Syrian Government Complicity. Syrian front companies had links to high-ranking government Syrian officials because Syria became the primary route for Iraq’s illicit imports over the last two years before OIF. Asif Shawkat, the deputy director of Syrian Military Intelligence, was involved in weapons trade with Iraq, according to a high-level Iraqi official. Shawkat is the brother in law of Syrian President al-Asad. Multiple reports indicate that Shawkat’s brothers, Mufid Makmud and Muhammad Mahud, managed his smuggling business. The Al-Mas Group, one of the Syrian companies that worked with the MIC, is owned by Firas Mustafa Tlas, son of the former Syrian Defense Minister Mustafa Tlas. The Al-Mas Group was composed of six companies that officially handled civilian goods but also dealt in weapons and military technology. In middle to late 2002, Firas Tlas represented his father in a deal to sell weapons to Iraq, possibly including missiles with a range of 270 km, according to Huwaysh. A Syrian named Ramy Makluf, another relative of Bashar al-Asad, reportedly owned the Nurallah Company, another firm that worked with the MIC. Makluf was involved in an effort to procure IGLA man portable air defense systems, Kornet antitank guided missiles, rocket-propelled grenades (RPGs), heavy machine guns, and 20 million machinegun rounds for delivery to Iraq, according to a high-level Iraqi official. The contract for the delivery of these munitions was signed in 2002 with a six-month delivery deadline, but the war intervened before the delivery. According to captured documents, the Iraqi MIC, and the Ministries of Trade, Defense, Industry, Transportation and Communication, and the Presidential Offices (Diwan) signed contracts with the Syrian front company, SES International Corporation, valued at approximately $186 million starting from December 2000 to March 2003. This figure differs markedly from the amount reflected in the SOMO records mentioned earlier. This particular document also indicates the degree of regularity under which these transactions occurred between Iraq and the Syrian company. SES signed 257 contracts with various Iraqi ministries during the three-year period. The document also reflects how the Iraqi ministries signed the contract with SES for a beneficiary company or other government organization. For example, the MoD signed one $185,780 contract with SES for the Presidential Office; the MIC signed another $1 million contract with SES for the Al-Qadisiyyah State Company. Although not a direct source of illicit military goods, Turkey provided Iraq with significant revenue streams that permitted the Iraqi Regime to fund its illicit procurement activities. In addition to the UN OFF program, Turkey signed a trade protocol that provided substantial monetary and material resources for Iraqi state institutions and procurement authorities. Since 1991, Iraqi-Turkish trade revolved primarily around the Turkish import of Iraqi oil products outside the UN OFF Program. Iraqi oil sales to Turkey were substantial. For instance, in March 2002, Iraq exported between 40,000 and 80,000 barrels of oil per day (bbl/d) to Turkey using approximately 450 to 500 Turkish trucks to transport the oil and oil products in spare fuel tanks. In February 2003, in the prelude to the war, this trade came to a halt. Illicit trade between Iraq and Turkey was built on the foundations of pre-Operation Desert Storm trade—Turkey had traditionally been one of Iraq’s biggest trading partners. This was formalized by a trade agreement signed by the two governments in 1993 and their other trade agreement, the Iraq-Turkey Trade Protocol, in 2000. Turkey was a secondary conduit for illicit purchases of civilian goods from 2000 until OIF. Under the auspices of the Iraq-Turkey Trade Protocol, Iraqi ministries and other entities would sign contracts with Turkish companies for goods and services prohibited by the UN’s OFF program. Information from a SOMO database shows that Iraq signed contracts worth almost $304 million, with payment dates from April 2000 through April 2003. These contracts reflect Iraq’s imports financed from SOMO accounts under the Iraq-Turkey trade Protocol. The funds most likely came from the protocol credit account controlled by SOMO. The CBI controlled the funds from the protocol cash account. ISG does not know if there were other expenditures for imports through Turkey from other SOMO or non-SOMO accounts (see Figure 58). The MIC was the only military or security entity that openly contracted with Turkish companies under the auspices of the Iraq-Turkey trade Protocol, according to the SOMO database. The MIC contracted for $28 million worth of goods—9 percent of the total procurement noted. Of this $28 million, 137 contracts were signed with at least 24 different companies. The single largest Turkish supplier seems to be Ozgin Cinko Bakirve Metal Mamulleri, Imalat Sanayi, although the name was listed in seven different ways. This company accounted for a total of 30 contracts with MIC worth over $10 million—36 percent of MIC’s total contract value. Although the SOMO database does not include specific information about the goods contracted for, the beneficiary companies listed include MIC research centers and manufacturing companies. In contrast to Iraq’s arrangement with Syria, the MoD did not import goods from Turkey under its own name. It did, however, import goods through the Ministries of Trade and Transport, according to the SOMO database. The MoT imported goods valued at $2.7 million (10 percent of its total contracts) and the MoTC imported goods valued at $48.9 million (59 percent of its total contracts) for MoD. Therefore, MoD’s share of total contracts was $51.6 million or 17 percent of the total contract value. Because the MoT sometimes acted on behalf of other entities, it is possible some of the MoT transactions not specifically mentioned as being on behalf of the MoD as mentioned above also were destined for Iraqi security, industrial, and research facilities. How much of these other MoT imports may have been destined for these end users is not known. In addition to the Turkish demand for cheap Iraqi oil and oil products, the Turkish government also tolerated, if not welcomed, the flourishing, mainly illicit trade conducted in the northern Iraqi free trade zone. Turkey and Iraq engaged in direct military trade for common military use materials. For example, documentary sources reveal that in 1997 the IIS, the GMID, and the Iraqi Military Attaché in Ankara dealt with the Turkish firm Sigma Gida IAS SAN VE TIC Ltd for the sale to Iraq of fireproof military clothing; 150,000 meters of material were purchased for $27 per meter. In lieu of cash, Iraq paid in oil. 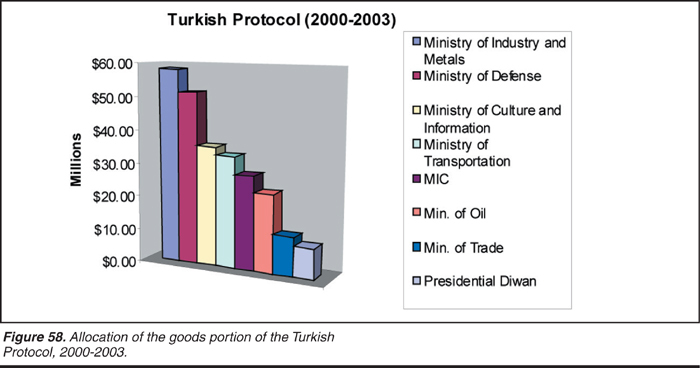 The Iraq-Turkey Trade Protocol also allowed Iraq to procure goods prohibited by the UN sanctions, although most of those goods were for nonmilitary uses. The Iraqi Finance Minister approved cash allocations to ministries from the Turkish trade protocol. According to captured documents, the Iraqi MoT procured 10,000 small generators, Mitsubishi pickup trucks, and assorted construction materials during 2002 through the Syrian SES International with money accrued by trade covered from the Turkish trade Protocol. Methods Iraq and Turkey used to Hide Illicit Procurement. Turkey did not undertake any active measures to hide its illicit trade with Iraq. Indeed, this trade was conducted in a semi-transparent fashion. Multiple open sources frequently reported the illicit trade between Turkey and Iraq. The illicit oil trade and most of the protocol trade was conducted through the Habur bridge (or gate) near Zakho on the Iraq-Turkey border. Both secret and open sources describe this flow of trade. Financial Flows Between Iraq and Turkey. High-level sources affirm that both Iraq and Turkey agreed to open a trade account denominated in US dollars in the name of TPIC (Turkish Petroleum International Company), but run for the benefit of SOMO, at the Turkiye Halk Bankasi A.S. (also known as Halkbank), a Turkish state-owned bank. This indicates a fair degree of complicity in illicit activity between Iraq and Turkish state institutions. According to the 16 January 2000 Protocol, 70 percent of the value of the crude imported by Turkey under the Protocol would be deposited in Halkbank. The remaining 30 percent would be deposited directly by the crude purchaser to accounts at the Saradar Bank in Lebanon or the Ahli Bank in Jordan that were designated by SOMO. Tekfen, a Turkish oil company, was the only company to deposit money into the Ahli Bank. Other Turkish oil companies paid into the Saradar Bank. According to open sources, since 2000 the UN OFF program, the trade protocol and other illicit Turkish oil importation, generated over $1 billion per year for Iraq. This revenue, however, pales in comparison to the $2.5 billion in bilateral trade that took place in 1990. SOMO documents state $710.3 million was collected from the Turkish Protocol from contracts signed between July 2000 and February 2003. According to SOMO documents, it is estimated SOMO collected $538.4 million in barter goods and cash through private sector trade outside the Protocol between November 1997 and March 2003. We lack information about earnings prior to these periods. Former Regime personnel indicate that the SOMO account at Halkbank was used exclusively for Iraq to pay Turkish companies for the sale of goods and services delivered to Iraq. The goods included oil sector equipment, industrial equipment and raw materials, communications and transport goods, and building materials. The total amount deposited in the account at Halkbank was $499,232,952. The total withdrawn equaled $302,305,033, leaving a balance before OIF of $196,927,919. Illicit trade between South Korean companies and Iraq was largely limited to contracts signed for high technologies, such as military computer equipment, sophisticated communications and radar systems. Although the South Korean Government was keen to promote South Korean companies to gain advantage in the international marketplace, there is no evidence to suggest that the South Korean Government was complicit in the transfer of prohibited goods. The earliest evidence detailing a military procurement deal with a South Korean firm was a 1998 negotiation between a Korean company and the Al-Basha’ir Company, trading petroleum products for six patrol boats. The evidence shows that from 2000 to 2001, South Korean companies provided technical components, software and expertise in the field of computerization and communications—assisting Iraq in its indigenous production of military computers and, thus, overall improvement of its conventional military power. As early as December 2002, delegates from the Iraqi Salah Al Din Public Company met with representatives of South Korean defense companies to finalize issues surrounding several contracts which had already been signed by both sides. As with other suppliers, Iraq used a network of front companies and intermediaries to conceal its activity with South Korean companies. These companies refused to directly supply Iraq resulting in their use of third party intermediaries from India, Jordan, and Syria to facilitate trade. In 2000, the MIC signed a contract with a South Korean company for technical expertise in establishing an indigenous computer design and production facility in Iraq. The contract included South Korean technical assistance for the production of computers for military purposes and the manufacture of circuit boards. The contract for South Korean technical expertise was signed for $14.4 million. In 2000, the IIS technology transfer division used two front companies (the Iraqi company Galala and an Indian front company, United Commodities) to procure computers, technical expertise, and training on computer design and production. Upon completion of this training, the MIC established an indigenous computer design and production line. This example illustrates the use of multiple front companies to hide the IIS role in the transaction. Exploited documentation illustrated that the MIC Commercial Department, through Dr. Hadi Tarish Zabun, Director General of Scientific Research facilitated “special contracts” for computers for a radar system and fiber optics for the communications system in 2001. In 2000, the Iraqi company Al-Ezz represented MIC in negotiations with a South Korean company named LG Innotech, which specialized in optical fiber and digital exchanges. According to captured documents, LG Innotech agreed to provide the MIC a total of 530 notebook-type hardened CPU systems specially designed for military use. The Iraqi Regime planned to integrate the $11.35 million of CPUs into its air defense systems and artillery fire control mechanisms. According to the same document, LG Innotech ultimately fulfilled more than 80 percent of the contract. This contract also used a third party and negotiated in parallel with the LG Innotech military CPU contract. An agreement with the Shinsung Company to acquire production plans and technology transfers of crystal units, filters, and oscillators. An agreement with Salah Al-Din and the Korean company UNIMO Technology Co. Limited to acquire portables and mobile radio technology transfers and to upgrade the existing production facilities in Salah Al-Din Company for hybrid circuits. An agreement between Salah Al-Din and Techmate Corporation of Korea for production and technology transfer of hand generators, coils and transformers, hand crank generator (GN-720) cable tester, image still picture transmission equipment, and coastal radar. An agreement with Armitel in South Korea for the technology transfer for the local manufacturing (assembly & test) of STM -1 optical transmission system (AOM-1155) with Salah Al-Din. Another element of illicit trade with South Korean companies focused on procuring fiber optics telecommunication technology with potential military applications. In 2001, the MIC’s Commercial Department signed a contract for fiber optics with the South Korean company Armitel. Payment, however, was not made because the equipment provided did not meet Iraqi specifications. The IIS coordinated with one of its agents to bring a delegation of experts from a South Korean company called Armitel. Their senior expert, Dr. Lee, visited Baghdad and as a result, signed many contracts with the Iraqi MoTC, specifically in the field of fiber-optic communications and military communications. These contracts were valued at $75 million. The MoTC and Armitel executed a portion of these contracts, delivering two shipments of more than 30 containers. Delivery was conducted through Lebanon using Syrian and UAE trade intermediaries. The first contract was delivered through Syria and the second through Lebanon. These contracts were covered through Syrian and UAE middle companies. Although China stated publicly on multiple occasions its position that Iraq should fully comply with all UN Security Council resolutions and cooperate with the Security Council and the Secretary General, firms in China supplied the former Iraqi Regime with limited but critical items, including gyroscopes, accelerometers, graphite, and telecommunications through connections established by MIC, its front companies, and the IIS. There is no evidence to suggest the Chinese Government complicity in supplying prohibited goods to Iraq It is likely that newly privatized state-owned companies were willing to circumvent export controls and official UN monitoring to supply prohibited goods. In supplying prohibited goods, Chinese companies would frequently employ third countries and intermediaries to transship commodities into Iraq. The Chinese-Iraqi procurement relationship was both politically problematic and economically pragmatic in nature, but it ultimately provided Iraq with prohibited items, mainly telecommunication equipments, and items with ballistic missile applications. This relationship allowed Iraq to improve its indigenous missile capabilities. One area of robust cooperation between Chinese firms and Iraq was telecommunications. These technologies had both military and civilian uses. Saddam's Regime used Chinese circuits and fiber optics to connect static command, control, and communication (C3) bases. UN sanctions impeded rehabilitation of the telecommunications sector. This equipment was sanctioned because of the nature of modern communications systems, which could be used both for civil or military purposes. These obstacles were overcome by the Iraqi Regime by acquiring materials for cash and procuring materials illicitly, outside the purview of the UN. One Chinese company, illicitly provided transmission equipment and switches to Iraq from 1999 to 2002 for projects that were not approved under the UN OFF Program. Reporting indicates that throughout 2000, Huawei, along with two other Chinese companies, participated in extensive work in and around Baghdad that included the provision and installation of telecommunication switches, more than 100,000 lines, and the installation of fiber-optic cable. In early January 2001, the Chinese company pulled out of a $35 million mobile phone contract in Iraq, citing difficulty it would face sourcing key components from a US firm. The company, which had been negotiating for two years on a Baghdad ground station module network, cited US Government pressure as the reason for its decision. Iraqi telecom official retaliated by putting all other contracts with this company on hold and cutting off contact with the firm. The company, however, in 2002 used Indian firms as intermediaries to illicitly supply fiber-optic transmission equipment for Iraqi telecommunications projects. A Chinese company was one of the more aggressive firms selling equipment to Iraq outside the UN OFF Program, including major fiber-optic transmission projects. Another company agreed to provide switches to Iraq as part of a large switching project for Baghdad prior to Operation Iraqi Freedom. Working with a second Chinese firm, this company participated in a bid for a project in Iraq not sanctioned by the UN. In late 2002 this company submitted a bid for a large switching system for Iraq. Reporting indicated that a Chinese company, working through a second Chinese company, had supplied switches to Iraq. This company's switches were used for both unsanctioned and sanctioned projects in Iraq. This company illicitly supplied the switches for the Jordan Project, a fiber-optic network in Baghdad that was completed in late 2000. This company might have been involved in supplying switches with more capabilities than specified in an UN approved project. Multiple sources clearly demonstrate that Iraq’s procurement goal with Chinese firms was to overcome weakness in missile inertial guidance capabilities caused by a lack of technical expertise and components. Iraq had limited capabilities in indigenously manufacturing gyroscopes and accurate accelerometers, compounded by the inability to purchase high precision machinery and equipment. Chinese companies willingly supplied these types of items to the Iraqi Regime. In mid-2001, Abd al-Wahab, an IIS officer stationed at the Iraqi Embassy in China, procured 10 to 20 gyroscopes and 10 to 20 accelerometers from an unknown Chinese company for approximately $180,000. The gyroscopes and accelerometers were intended for the guidance and control system of the al Samud II and Al-Fat’h missiles. Al-Najah Company, working through an Indian intermediary, purchased supplies of Chinese missile-grade graphite during August and September 2001. In January 2003, Al-Merbab General Trading Company and Al-Ramig sought a supply of chemicals, both of which have applications in liquid rocket propellants, from Chinese companies (see inset). The Chinese companies, however, refused to sell chemicals to the Middle East because of its potential weapons application. From the Iraqi perspective, MIC and IIS attempts to illicitly acquire goods from Chinese firms were problematic. MIC and Chinese suppliers conducted many committee meetings and had other contracts, but most meetings never ended in any signed contracts. According to a high-ranking official in the MIC of unknown reliability, Chinese firms used its military and dual-use contracts with the MIC as leverage in its attempts to obtain discount-priced Iraqi oil. Documents recovered indicate that an Iraqi delegation was sent to China to reestablish a partnership with NORINCO, a Chinese arms manufacturer. NORINCO agreed to continue dealing with Iraq despite a debit of $3,067,951,841.47 but NORINCO specified that Beijing would not be informed of the deal. Iraq promised to repay NORINCO with crude oil and petroleum products, using the Iraqi front company Al-Basha’ir. These strained negotiations sometimes resulted in the use of alternative foreign suppliers. This was evident in procurement attempts to acquire gyroscopes from Chinese firms where MIC companies sought alternative suppliers in Belarus. Although the Chinese Government promoted Chinese companies in commercial activity following defense reforms in 1998, ISG has found no evidence to suggest Beijing’s direct involvement in illicit trade with Iraq. Indeed, we suspect that some contracts that were abruptly stopped may have been a result of Beijing’s direct intervention. A delegation from a Chinese firm to Iraq in December 2000, suspended contract talks possibly according to Beijing’s questioning of its activities with Iraq. Most transactions, however, were orchestrated through newly privatized state-owned companies competing in a bloated and highly competitive, newly founded commercial system where they were able to participate in illegal trade with little oversight. As with other suppliers, Iraq procured illicit goods from Chinese companies behind a network of front companies and trade intermediaries. Turkish, Syrian, Indian, and Jordanian intermediaries were used in the procurement process for both seeking quotations of goods and in assisting delivery of prohibited goods. In all likelihood, the various trade protocols provided a legitimate trade cover under which these illicit transactions took place. As in many other cases, the Syrian-based SES International Corporation was used as an intermediary between Chinese companies and Iraq. In October 2001, Syrian technicians were dispatched to China on Iraq’s behalf to contact influential Chinese air defense companies. Follow-on meetings were to be held in Beijing and Damascus. An Indian affiliated, UAE-based firm was also used as an intermediary to facilitate trade in graphite and ballistic missile-related goods from Chinese firms. In conjunction with the use of brokers and intermediaries, the IIS employed Chinese personnel as IIS agents to obtain prohibited goods and build relations between entities. In one case, the IIS tasked Professor Xu Guan, a member of the Chinese high committee for electronic warfare to collect information on laser-tracking systems, laser guidance systems and information on cooperation between Iran and China. The IIS also stationed its own officers at the Iraqi Embassy in China to manage the Iraqi-Chinese relationship and facilitate trade. The French-Iraqi procurement relationship existed within a larger bi-lateral political relationship, which was turbulent and problematic throughout the 1990s up until OIF. From Saddam Husayn’s perspective, the relationship was built on Iraq’s hopes to influence a permanent membership on the UN Security Council against the United State and UK (see the Ministry of Foreign Affairs section). Illustrating Iraq’s persistent efforts to curry favor in Paris, France, was one of the top three countries with companies or individuals receiving secret oil vouchers (see the Oil Voucher section). Iraq also awarded numerous short-term contracts under the UN OFF program to companies in France totaling $1.78 million, approximately 14 percent of the oil allocated under the UN OFF Program. In 2001, Tariq Aziz characterized the French approach to UN sanctions as adhering to the letter of sanctions but not the spirit. This was demonstrated by the presence of French CAs in Baghdad, working to promote the interests of French companies while assisting them in avoiding UN sanctions. Behind this political maneuvering, ISG has found evidence that French companies, after 1998, sought and formed procurement relationships with Saddam’s Regime. These relationships could have been renewed partnerships developed before 1991 when France was a major conventional arms supplier for the Iraqi Regime. These procurement transactions included offers and contracts for conventional weapons systems and negotiations for possible WMD-related mobile laboratories. Recovered documents dated December 1998 and September 1999 indicate that the French company Lura supplied a tank carrier to the Iraqi MoD. A French expert, “Mr. Claude,” arrived in Iraq in September 1999 to provide training and offer technical expertise on the carrier. By 1999, recovered documents show that multiple French firms displayed a willingness to supply parts for Iraqi conventional military items, mainly related to aircraft. Documents from the Al-Hadhar Trade Company, dated November 1999, describe a delegation of French companies that had participated in an International Exhibition in Baghdad. One of the companies was willing to collaborate and supply spare parts for the French Mirage aircraft. IIS documents dated from December 1999 to January 2000 show that the Deputy General Manager of a French company called SOFEMA planned to visit Iraq on 15 January 2000 on behalf of a number of French military companies to “seek possible trading between the two countries.” An accompanying top secret document from the GMID, M6 Section, corroborates this meeting and further ties the purpose to Iraqi air defense capabilities. ISG uncovered further conventional military trade in November 2002 when a French electronic warfare/ radar expert named “Mr. Cloud” (possibly Mr. Claude from the section above) met with representatives of the Al Kindi Research Facility. According to captured documents, the purpose of the visit was to facilitate military-related microwave, direction finding, and passive radar technology transfer. The recovered documents include military-related technology transfers and Iraqi contractual agreements with foreign manufacturers. Beginning in late December 2002, the MIC initiated efforts to acquire replacement parts for the Roland II Surface to air missile system, valves for Iraq’s air defense system, and various other high technology items with military and battlefield applications. These efforts were underway with Majda Khasem Al-Khalil (a Lebanese female) who in turn met with the French Thompson Company representatives. ISG found evidence of coordination on this procurement up until 23 days before OIF. According to captured documents, Iraq and FRY cooperated extensively both militarily and economically when the Milosevic Regime was in power. This cooperation ceased when a democratic government took power. For example, talks were held between Iraq and the former Yugoslavia on military and economic cooperation from 25 February to 2 March 1999. The Iraqi side was represented by the Minister of Defense, Sultan Hashim Ahmad al-Tai. Maj. Gen. Jovan Cekovic, the Director General of the Yugoslav company, Yugoimport, headed the Yugoslav side. The documents detail the Protocol resulting from the meetings. The two countries expressed their readiness to re-establish and continue the military-economic cooperation, which they considered one of the most co-operative bilateral endeavors. According to the documents, the two sides agreed to foster greater cooperation among all services of each country’s military forces. During the meetings, Iraq informed the Yugoslavians that because of the current economic situation in the country, it is not able to provide funds for the future cooperation. To remedy this problem, the Iraqi side proposed the supply of crude oil and its product instead of currency as a viable solution. The two sides then agreed that the next session of the Joint Committee for Military and Technical Cooperation was to be held in Belgrade in April 1999. A source that was a senior executive in the MIC stated that the former Federal Republic of Yugoslavia cooperated closely and extensively with the IAEC, the MIC, and the MoD. Representatives from Yugoimport Federal Directorate for Supply and Procurement (FDSP), a Yugoslav company, signed numerous business contracts with Iraq. Their Baghdad representative was Colonel Krista Grujovic. During the start of business with Iraq, which was sometime around early 1998, Yugoimport opened accounts in Amman, Jordan, for Yugoslav Federal under the trade name Yugoimport FDSP. However, after a period of time their name was changed to MIKA (also known as MEGA), a Lebanese company. Yugoimport FDSP was then effectively eliminated from all bank records and other documents. Reportedly, Mahud Muhammad Muzaffar was in charge of the Yugoslav procurement connection and was universally liked within the MIC. The Iraqi Government sent him under diplomatic cover to work as a scientific advisor at the Iraqi embassy in Belgrade. When Yugoslav companies spoke to Muzaffar about doing business with Iraq, he would connect their company contacts to MIC representatives. Yugoslav Federal was a military institution under the management of the Yugoslav Ministry of Defense.It was responsible for overseeing several Yugoslav military production companies. Yugoslav Federal signed the foreign trade contracts on behalf of these military production companies in exchange for a certain percentage of the profits. Yugoslav Federal also supplied materials and expertise directly to Iraq from the Yugoslav production companies. A senior executive at the MIC stated that the financial transfers between Yugoslavia and Iraq were under the supervision of the Belarusian Infobank. Infobank also issued security bonds for the advance payment portions of the contracts. The contracts were signed pursuant to the Iraqi-Syrian Protocol where the payments were made through a third party, usually a Syrian-based company. This Syrian company would pay the contract amount to the Belarusian bank in exchange for a 10- to 12-percent cut of the value of the contract. According to the senior executive of the MIC mentioned above, the former Yugoslavian Government was represented commercially through the use of experts and ex-military personnel to assist in the transfer of technology and technical expertise for new military projects. The coordination was under the direct supervision of the MIC Director, Abd al-Tawab Mullah Huwaysh, Dr. Hadi Tarish Zabun, head of special procurement at the MIC, and the Iraqi Deputy Minister of Defense. This source also stated that the President of Yugoslavia opened accounts in Amman, Jordan. under the Lebanese cover company MEGA. In October 2002, Stabilization Forces (SFOR), Bosnia and Herzegovina, conducted an inspection of the ORAO Aviation Company, in Bijeljin, Bosnia and Herzegovina. Over 60 computer hard drives and a large number of documents were seized. Among the captured documents was a five-page memorandum that documents the discussions and agreements between ORAO, Al-Salafa, and the Iraqi Ministry of Defense concerning the illegal shipment of R13-300 and R25-300 jet engines for the MiG-21. Included in the memorandum is an agenda for the enlargement of existing capacities for overhaul of R13-300 and R25-300 jet engines. The agenda also included a realization of an old agreement for overhaul of the engines in the former Federal Republic of Yugoslavia. The time limit for the delivery and assembly of equipment was to be up to nine months. Other documents captured indicated that the MIC front company Al-Basha’ir was also involved in the deal, as well as Yugoimport. According to a contract between the two companies, the total amount of the deal was worth $8.5 million. Al-Basha’ir was to be responsible for transporting the equipment from Syria to Baghdad for a total price of $300,000. As of May 2000, 45 overhauled engines had been delivered; however, captured documents detail a dispute between ORAO and Iraq’s Ministry of Defense over the price and delivery of 19 remaining engines. Al-Salafa is an Iraqi company that is a part of the Al-Eman network of front companies. Although the procurement relationship began in 1998, from 2000 until the start of OIF, the MIC conducted business with the Bulgarian JEFF Company, a company that the IIS recommended the MIC use. The JEFF Company’s headquarters was located in Sofia, Bulgaria. According to a senior executive in the MIC, the Bulgarian government was aware of the dealings between the JEFF Company and Iraq. ISG cannot confirm this claim. The MIC used the Al-Basha’ir Company to coordinate contracts with JEFF. To establish a contract, JEFF personnel would travel to Iraq to meet with the Al-Basha’ir Company or vice versa. Al-Basha’ir would then deliver the contract to the Commercial Department of the MIC where an arrangement for the contractual payment would be made. Reportedly, Bulgarian companies exported numerous military items to Iraq after 2000 in violation of UN sanctions (see figure 59). The MIC had contracts with the JEFF Company for engines and maintenance parts for the T-72 tank and Igla manportable air defense systems (MANPADS). The Bulgarian company ELMET provided components for Iraq’s UAV programs. Captured documents detail the illegal procurement of missiles with tandem warheads, launcher units, thermal imagers, test units, and simulators. The deal was brokered between Al-Basha’ir, SES International in Syria, and the JEFF Corporation in Bulgaria for 175 Kornet antitank guided missiles (ATGMs). The contract specified that Al-Basha’ir was acting on behalf of the MIC of Iraq. Delivery of the ATGMs was to take place in March of 2003, but it is unclear whether the delivery actually took place. In 1998, Bulgarian companies contracted with Iraq to provide numerous dual-use items such as ammonium perchlorate, aluminum powder, phenolic resin, carbon fiber, and machine tools. Recovered Iraqi documentation stated that the end use for these goods was for the Al Fat’h missile. Ammonium perchlorate is an oxidizer that makes up over 50 percent of the propellant weight of a modern solid propellant. Aluminum powder is mixed with the ammonium perchlorate and it acts as a fuel in the solid propellant. These two chemicals make up the bulk of the propellant mass. These basic items were used in the Iraqi Badr 2000 missile system, which was destroyed by UNSCOM. But the Ababil and the Ab’our missile system used these items in their propellant. Phenolic resin is a very special high-temperature resin used by Iraq to bind and hold in place the carbon fibers. The carbon fiber with the phenolic resin could be used in making lighter weight motor cases, nose tips, or nozzle throats. These areas experience high heat and using a light material lessens the overall weight of the missile, extending its range. Prior to 1991, the Iraqis had made missile parts from carbon fiber and had expressed a desire to UNMOVIC to again use carbon fibers. Carbon fibers could also be used in the fabrication of high-strength centrifuges for the enrichment of uranium. For these reasons both UNMOVIC and IAEA placed carbon fiber on their watch lists as a controlled material. In 2001 Iraq used the Syrian Protocol to purchase numerous machine tools from Bulgaria. 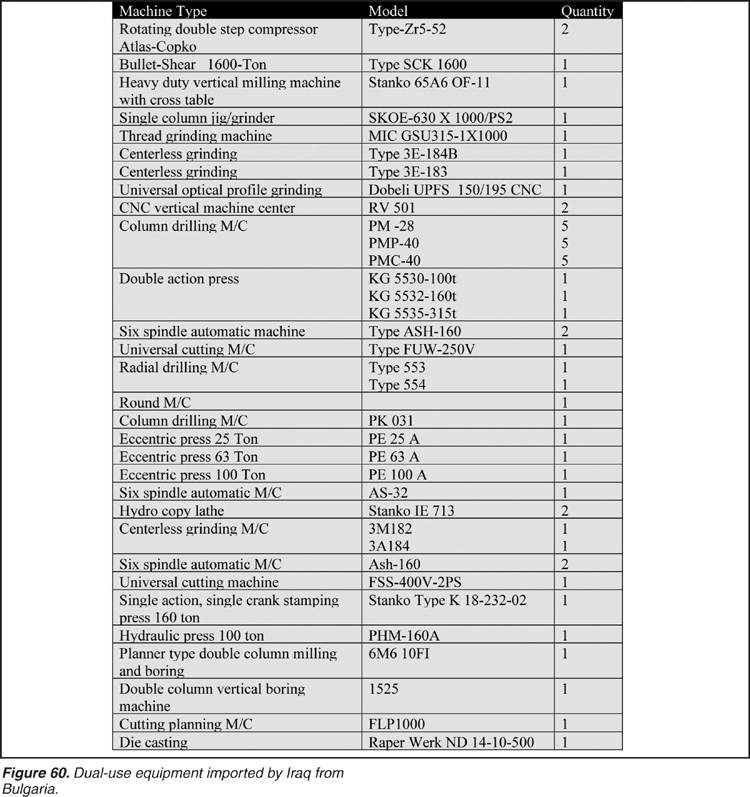 Some of these machines are numerically controlled (CNC) or are capable of being adapted for CNC. Such equipment was controlled under the Goods Review List (GRL) and would have needed to be approved by the UN before being exported to Iraq. All of these dual-use machines could be used for the production of civilian goods. However, many of these machine tools can be used in producing conventional military items, CW, or nuclear programs, particularly the shaping of materials such as polytetrafluorethylene (PTFE) or metals. For example, rocket motor cases or propellant tanks start as a large sheet of metal that needs to be cut, shaped, rolled, drilled, milled, and welded to form the correct shape. CNC machines allow the operator to program exact instructions into the computer so it can precisely reproduce a pattern a thousand times over to the same specifications. This is critical for both missile and nuclear components. Figure 60 details these transactions.